BCA Industries ES1000ST shredder uses the same base and shredder and drive as the ES1000 with the added benefit of a recirculating trommel screen. This unit can be used alone as a single machine or in conjunction with a primary shredder for increased through put. Unit comes standard with a 24" x 10' out-feed conveyor which mates perfectly with the discharge hopper. Material input height is the same as our standard ES1000 primary shredders which enables ease of up grading to a multi shredder application using existing conveyors. 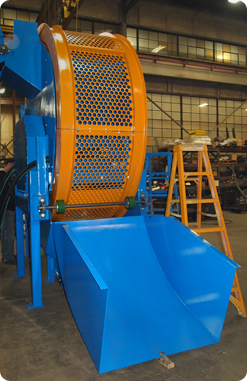 Trommel screen is 96" diameter and is a two piece design for quick removal to maintain shredder head. Simplicity is the key. Material enters the shredder and is discharge onto the rotating screen. Material which is not to size is returned back into the shredder by angled paddles. Material is recirculated in this fashion until proper size is achieved. Trommel screen drive consists of two shafts supported by heavy duty bearings. Each shaft has two heavy duty neoprene clad wheels which drive, support and guide wheel. All wheel components are shrouded by removable covers to meet OSHA safety guidelines. Total foot print for this machine (including in-feed conveyor) is only 250 sq. feet! It's simple, efficient and yet reliable! Make chips today with one machine, and upgrade when you want to. Call today and let's talk about your recycling needs.